We can’t have a party without a rare release so we have brewed a ” German Golden Ale” just for the occasion. Vaqueros Texas Bar-B-Q will be out here from 1-dusk cooking up Arlo’s favorite meats! All our furry friends will need to be on a leash and attended to at all times. This policy will be strictly enforced with the only exception being for the birthday boy Arlo. We appreciate your cooperation. 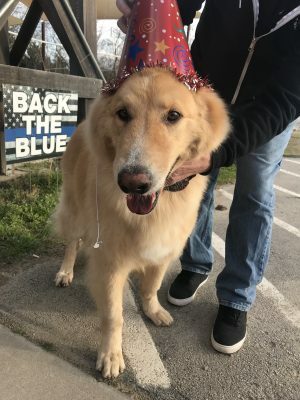 Fort Worth Abandoned Animal Alliance is a 501c3 nonprofit rescue dedicated to helping the abandoned, neglected, and abused animals in the Fort Worth area. *Arlo glasses are limited to the first 100 charity pints. Once we run out of the Arlo glass we will be handing out Shannon Logo pint glasses for the charity pints.